Here is a film that works in spite of its director’s better intent. 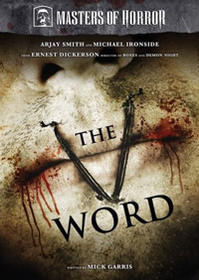 Ernest R. Dickerson’s The V Word, an episode of the “Masters of Horror” television series, is a violent, thrilling, entertaining, and successful vampire flick that rises above its own failed social commentary. It is clear that Dickerson had better intentions for his film than for it to be a simple exercise of blood and guts: the over-the-top death scenes are a constant reminder of his own blatantly obvious views on violence desensitization, established thoroughly in the first scene of a teenager sitting in front of a television screen, allowing the violent images of a video game to reflect in his long, unblinking stare. But here excessive violence is representing a somewhat milder but more real-world violence and is being presented to an already desensitized audience, so the persuasive nature of the film has trouble overcoming the fact that the violence is so damn entertaining. Though this does defeat what I can gather is the true purpose of the film, the entertainment provided does mildly distract the viewer from the film’s shortcomings, most notably its stagnant second act, which aims to expound the plot but just clutters it with meandering scenes. This is not a plot in need of expansion. That’s because The V Word is carried on a premise simple in design but effective in execution. One night, during a rousing video game session, Justin (Branden Nadon, Agent Cody Banks) asks his friend Kerry (Arjay Smith, The Day After Tomorrow) if he has ever seen a real dead body before. Of course Kerry has not, so the teens venture to the local morgue to catch a glimpse of a real corpse. Among the corpses, the teens find the morgue’s owner, Mr. Chaney (Michael Ironside, The Machinist) and discover his secret: He is a real-life vampire. The morgue interiors provide admirable cinematography and lighting that makes the first half of this sixty-minute film quite impressive. Dark, ugly greens and reds provide patterns on the floors and walls, and the mix of the two colors is nauseating, which would be considered a desired effect for this film. Once the vampire makes his appearance, the shadows that he casts on the walls as he reaches out for the boys is reminiscent of Nosferatu and the German Expressionist movement of that time. However, at the start of the second act, the action moves from the morgue to Justin’s house, which is not nearly as cleverly painted or lighted, the movie’s pace slows to a painful lurch. Justin, having been bitten and showing signs of turning, stalks around the house while Kerry, freshly turned, is lurking around the outside. There is little chemistry between the actors to begin with, and their interaction and ineffectiveness during the scenes that make up the middle of the movie makes for an even slower act two. Instead of more action scenes, these scenes inside Justin’s home manage to waste an already short runtime. Thankfully there is a stronger third act to this film, one that provides the most entertainment because it provides some of the best bloodshed. For a film shot on a presumably shorter budget than a feature film and meant for a television audience, the effects that Sarah Graham manages with her team of special effects makeup artists is truly remarkable. Blood pours from the necks of vampires and humans alike, and the final death of the movie is one of the most glorious and satisfying endings that I’ve seen in quite some time, if only because of how simply gruesome it is. It almost seems effortless. If the film didn’t meander on afterward for ten more minutes, it would have certainly been the perfect conclusion. I have not had the privilege of watching each entry into the “Masters of Horror” series, so to compare this episode against previous ones would contain too much ignorance. 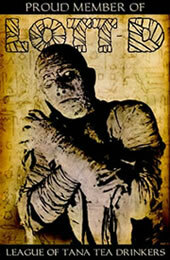 On its own, The V Word is a thrilling and engaging triumph of putrid horror and ghoulish shock. Beneath the buckets of blood is the film’s true purpose, a persuasive undertone that is lost to the copious amounts of gore that provide more entertainment than enlightenment. Although The V Word fails in its better intentions, it does provide sixty-minutes of sheer excitement, and to the desensitized audience, the result could not be bloody better. Submitted by Veritas (not verified) on Sat, 2015-06-13 23:33. It was like sitting through an Obama speech.